Gentry’s interest in the genus Agave developed in the early 1930’s while collecting herbarium specimens for university herbaria. After retirement as an ethnobotanist and economic plant explorer from the USDA he returned to the study of agave. It was his dream to study in situ and ex situ every agave species in North America, the Caribbean excepted, and to publish his research in what was to be the definitive monograph on the ethnography and taxonomy of agave: The Agaves of Continental North America. Beginning in 1951, Gentry visited the Huntington’s Desert Garden yearly, bringing plants from his explorations in Mexico. He would wander among our large specimen agaves as if greeting old friends. On each visit, he usually found one or two agaves for his herbarium that needed further study. He always needed an entire leaf to press and his favorite cutting tool was a long and very sharp fish filet knife that he had with him at all times. Cutting an entire large agave leaf was no easy trick. In the case of a large pulque agave, such as A. salmiana, with eight foot leaves, he would climb into the prickly rosette and deftly cut out the entire leaf. When an unidentified agave flowered for the first time, particularly one he collected, he would borrow our pole pruner to remove a flowering specimen. There were many occasions when an agave flowered that we pressed the specimens ourselves and sent them to him for identification. Many of the Huntington’s agaves were identified by Gentry. There are several illustrations and references to the Huntington’s agaves in Gentry’s monograph. Most of those that offset are still growing in the garden. In addition to his own collections, he studied our collections, pressed and living, from the Huntington’s travels in Mexico. There are many citations of plants examined that were collected by Myron Kimnach, Gary Lyons, Fred Brandt, Fred Boutin and other staff members. One of Gentry’s collections described from plants in the Huntington Desert Garden is Agave parryi var. truncata. It was not described until he saw it flower here for the first time in 1977 (see photo, p. 544, fig. 19.7). He gave it to us in 1951. All the plants now in cultivation have been propagated from this plant and first introduced to cultivation at one of our early plant sales. When Gentry saw the plant in flower he remarked with consternation that it is gigantic (he applied that critical observation to all our agaves), complaining that we gave them too much water and the plants bore little resemblance to those in the wild. 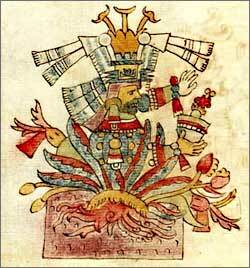 Mayahuel, the Aztec goddess of pulque, is depicted as an anthropomorphic inflorescence emerging from a very large agave. Gentry confessed his frequent liquid communions with the goddess while plant hunting in Mexico. He always travelled with a bottle of the modern concentrated agave juice known as tequila.